Recognizing the potential danger which is present in any transaction, the Trade Federation Middle program allows for the use of a trusted and insured middle for any and all transactions. The Middle Program is comprised of long standing, respectable and honorable members of the trading community. These members are trusted to serve as middles between sales and trades. It is highly recommended you use a middle when doing any sort of trade or sale. In addition, the Trade Federation will insure their approved and certified middles with Trade Federation funds. 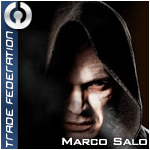 In the event you use a Trade Federation middle and the middle does not fulfill his or her duty, the Trade Federation will reimburse you the transaction value in credits, up to limit prescribed by the Middle's Level. The Trade Federation middleman program will only reimburse people who were stolen from a sanctioned Trade Federation Middle while they are middling a trade/sale. 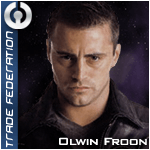 The Trade Federation will notify the trading community of corrupt middles via the traders lounge and the news section of the Trade Federation Market website. To report a middle theft you must send all evidence to the Chair of the Middles Approval Committee within 72 hours of the theft. The Trade Federation won't be responsible for any traded goods found without access due to planetary shields or security doors. It is impossible for a middle to know of these circumstances. Before sending assets for middling to a Trade Federation sponsored Middleman you must Darkness Message (DM) the Middleman to confirm that they are available and willing to do so. 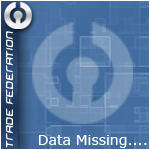 The Trade Federation will not reimburse traders who fail to do this, if the middling service is delayed on account of this, or if the assets are returned to the sender at the Middleman's first available opportunity. For users on the Trade Federation Market, this step is unecessary, as only active middles will be shown on the Middle Services page, and they will be notified automatically when the 'use middle' option is selected. 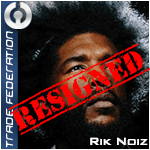 Only Trade Federation Members may become registered Middles of the Trade Federation. Full details are available in the Trade Federation Code of Commerce. The present chair of the Middles Approval Committee is Tanez Kalrade. 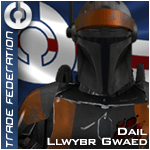 Note.. Only middlemen bars hosted on the Trade Federation server are considered official. Always check the Middlemen list before using a sanctioned Trade Federation Middle. Scammers are known for impersonating middles. 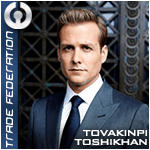 The Trade Federation Department of Trade is insured up to any amount. It may only be used to middle transactions valued in excess of 800,000,000 credits. The most trusted members of the Trade Federation. Some of the most trusted and longstanding members of the Trade Federation. These are also individuals who have established themselves as trustworthy traders. 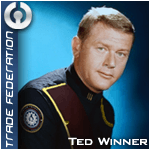 Members of the Trade Federation who have established themselves as trustworthy traders. Junior members of the Trade Federation who have established themselves as trustworthy traders.